Contrary to common notion, the functioning of two-way radios is quite similar to regular radios. Even two-way radios receive radio waves over the air. When these waves are received by a regular radio, it converts the waves into sound. However, two way radios are also able to convert sound into radio waves. Thus, these waves can be transmitted to the other radio and back. In simple terms, two-way radios are exceptional gadgets which can transmit and receive a radio signal at the same time. Moreover, these radios also use two separate radio frequencies. Due to this, they’re able to send and receive signals simultaneously. These radios have an antenna which carries a specific set of electrons. During transmission, RW or radio waves encourage these electrons to produce standard electrical impulses. Two-way radios have a processor, which uses sound vibrations to transmit signals. These vibrations are caused by the speaker’s voice. Vibrations are converted by the radio into electronic signals. These signals are transmitted to the other receivers. Radio waves can be easily generated by using modulated frequency. This frequency is sent to the antenna of the radio. Radio waves can also be transmitted to multiple receivers in the same area. However, such transmissions will depend on the atmospheric conditions, battery power and the size of your radio’s antenna. In the last few years, the two-way radios have completely evolved. These days, you can purchase two-way radios which allow scanning. With this feature, a user can check if another person is sending a clear transmission on a specific frequency. In case your radio detects a private line tone, it will automatically lock onto the channel. Thus, the user will be able to transmit and speak on the frequency. Modern radios also allow users to use multiple channels. However, it is only possible when a radio generates and transmits radio waves in multiple frequencies. Moreover, these frequencies should have slight fluctuations with each other. These gadgets are considered to be quite special and therefore they are always in demand. Two-way radios provide instant communication and easy accessibility. 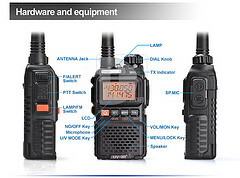 You can also use these radios to communicate with a group of people at the same time. You will not have to call every person individually. Two-way radios can be used for a lot of different purposes. These radios are mostly used in recreation camps, public safety drills, military drills, security companies, medical industries, food industries and other such businesses. They can even be used by children as toys. These days, two-way radios are available in a lot of different designs and sizes. You can even buy them online at affordable prices. These gadgets are neither complicated nor require any technical training. Almost every person can use the device without any problems. They are even less complex than laptops and mobile phones. If you want to have some fun with your child or communicate with people in close distances, two-way radios from two way radio shop can be a perfect choice. As mentioned above, these radios can be used in a lot of different situations. Even some of the most popular communication devices cannot overshadow the benefits of these easy to use gadgets.